Ever since my first goal was set for me in 1973, there was no turning back. My incredible AAU swimming coach, Craig McConnell was big on goals and our family had just moved to Tampa, Florida. As a new member of the Greater Tampa Swim Association (GTSA), I was an unknown commodity. Let me back up a bit. I began swimming at the age of 8 after my older brother Philip started bringing home ribbons and medals from swim meets. To put it bluntly, I was jealous. Age group swimming in Minnesota was a sound place to start developing my talents and a love for competition. It was more ‘fun’ than hard work and I could tag along with Philip, maybe that’s why I liked it so much. Then came a family move to Tampa, Florida the summer after 6th grade. Little did I know I had arrived in swimming nirvana. Age group swimming with GTSA in Florida, like football in Texas, was intense. I clearly remember something called a ‘get out swim.’ It happened near the end of a particularly difficult swim practice. Our coach would (strategically) pick someone to do a swim. If the “lucky” swimmer beat the goal time set by Craig, you got everyone out of practice early; if not, they all had a do one last hard set. I barely knew anyone, so felt sick to my stomach when my name was called. Craig picked the 100 freestyle and I had to beat a 1:02 at the end of a hard practice when I was just 12, one of the youngest wet heads in this group. Four lengths later I touched under a minute. I had beaten my first goal, impressed the coach and made lots of new friends at the same time. The relief was immediate and satisfaction immense. I was now hooked. Craig continued to set goals with me each of the six years he coach me. He would sit down one-on-one with every swimmer during practice, pulling us out of sets one by one, and set personal goals. I clearly remember one particular goal set the summer of 1974. Craig wrote down a time for a 50 yard freestyle. “Wow, that’s fast,” I remember thinking. He explained the time is the national 11-12 age-group record and that was my goal for the season. Shocked, I was both petrified and inspired to think my coach believed in me enough to set such a lofty goal. Long story short, I broke the 50 yard freestyle national record that year, as well as the 50 meter freestyle and nearly broke the 50 butterfly record as well. My coach knew what I was made of long before I did; he believed in me and helped me to believe in myself. A gift. A true gift to a developing 12-year old. Thank you Craig, for showing me the value of goal setting. I find my life since then has been a series of goals – whether athletic, academic, community or personal. Most goals reached, a rare few left unattained. Being diagnosed with DCIS gave me an immediate goal: to get “it” out and later to complete reconstruction. The second half of my goal was reached on May 1, 2012 when Dr. Ferlmann, my plastic surgeon released me. There were smaller goals along the way and once one surgery was complete, the rehab began….walking to the end of the hallway, to the end of the block, one mile, four miles…and so on. 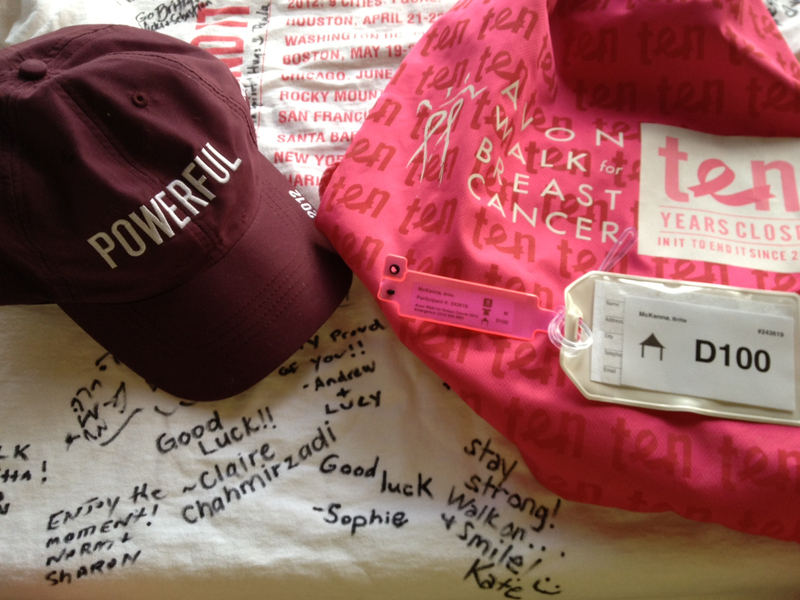 One of my current goal was set on February 29, Leap Day: to complete the Avon 2-Day Walk for Breast Cancer. With that goal only 5 days away, I am starting to get nervous. With all goals, at times your subconscious doubts whether you’ve prepared enough and if you are really “ready.” Of course I’m ready. I followed the prescribed training program, purchased the right shoes and socks and have repeated the mantra, “cotton is rotten.” A mild set back during my 22 mile training walk 9 days ago is weighing heavy on my mind, but I’ve done what I need to do to recover – a trip to a massage therapist and my physical therapist. The miles walked in training have been therapeutic, motivational, helped me reach a different goal (lose weight) and prepared me to reach the goal of finishing the walk. Funny thing is that on my personal Avon page, I set my fund raising goal first at $1,800, which was the amount needed to participate. Once I reached that, I immediately reset the goal to $2,000, then again to $2,500 and will leave it at $3,000 (really). It seems that once I’ve reached a goal, another is needed to inspire me. It’s just how I’m wired. Thanks Craig! If you want to help me beat my goal, visit my Avon personal fund raising page at http://info.avonfoundation.org/site/TR/Walk/Chicago?px=6387399&pg=personal&fr_id=2171. Yesterday as I gazed up into the neighboring maple trees while swinging in our backyard hammock, my mind became a wanderlust of thoughts about the future and what goals may be ahead. I’ll try and hold off a week to focus on the goal at hand. But yes, I’m sure a new goal is looming on the horizon. What’s your goal and what are you doing to reach it?